Datalog 2.0 is a workshop for Datalog researchers, implementors, and users. Its aim is to bring together researchers and practitioners interested in different aspects of Datalog to share research experiences, promote collaboration and identify directions for joint future research. The 3rd International Workshop on the Resurgence of Datalog in Academia and Industry (Datalog 2.0 2019) will be held in Philadelphia, USA, on June 4-5, 2019. 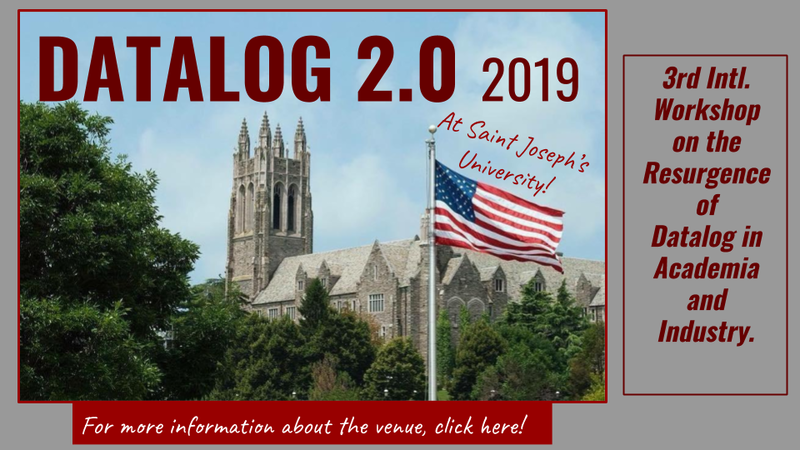 Datalog 2.0 2019 is a major event of the Philadelphia Logic Week 2019, which is dedicated to the research on logic, knowledge representation, and reasoning. The other major event of the Philadelphia Logic Week 2019 is the 15th International Conference on Logic Programming and Non-monotonic Reasoning (LPNMR 2019). The first edition of Datalog 2.0 was held in Oxford, UK, in 2010, and it was by invitation only. Since Datalog has resurrected as a lively topic with applications in many different areas of computer science, as well as industry, the second edition of the workshop, which was held in Vienna, Austria, in 2012, was open for submissions. The indicated number of pages includes title page and references. All submissions will be peer-reviewed. Accepted papers will be submitted for publication in the CEUR Workshop proceedings. Authors can opt-out if desired. At least one author of each accepted paper must attend the workshop to present the work. Submissions must be written in English, and formatted according to Springer’s guidelines and technical instructions. Paper submission is enabled via the Datalog 2.0 2019 EasyChair site. The journal Theory and Practice of Logic Programming (TPLP) will devote a special issue for a joint event of LPNMR/Datalog 2.0. Four to six papers will be selected for a rapid publication. In case of invited papers for a rapid publication in TPLP, there should be at least 30% new content compared to the published workshop paper. The extra material should consist of extensions of the existing material such as proofs, further experimental results, and implementation details. New results could be included too, if appropriate. Authors invited to submit to the special issue should confirm that such extra material is available.